Light up a dark campsite or a predawn trail adventure with the UCO 100 headlamp. Its hingeless design delivers a comfy fit, while the stylized strap adds some personalized cool to your kit. Made from durable materials, this UCO 4-piece mess kit is built to bang around in your rucksack on the weekend, then pack your lunch on Monday morning. 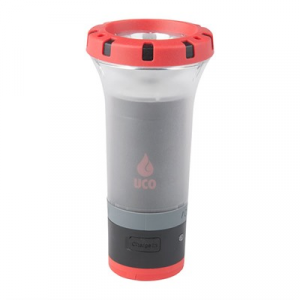 Brighten up the campsite or the trail ahead with the UCO Air headlamp. Its bright beam and ultralight, rechargeable design make it a no-brainer to bring along on after-dark adventures. Start a fire in any weather with this set of 3 UCO Behemoth Stormproof Sweetfire strikable fire starters. Each one provides up to 15 min. of burn time. Charging up a moonlit trail or breaking down the campsite at dawn gets a lot easier with the UCO Beta headlamp. Its bright beam lights the way, while its outdoor-inspired styling makes an entrance. These replacement, dripless candles are made from natural beeswax, offering a long burn time, pleasant aroma and less smoke. These dripless candles can be used in candle lanterns and for emergency lighting. Use this replacement glass cylinder for any of the UCO Original candle lanterns. The family-sized UCO Candlelier candle lantern burns 3 candles for extra bright light. It's great for camping, picnics or power outages.